Categories > Card Magic > Card Press - Do they Really Work? 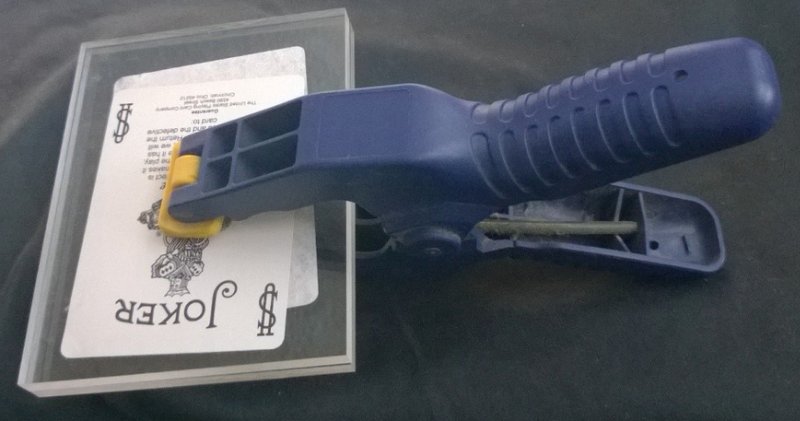 I ordered a card press because I have been trying my hand at making my own playing cards. The process of putting coating on them makes them curl up something awful. The author of the book on doing this told me that after the cards are all cut, just put them in a card press overnight to flatten them out. So I ordered the Crystal Card Press by Hondo & Fon from Penguin Magic. I put the cards in there for 24 hours at the tightest setting I could muster with the thumb screws. It didn't really help much! I also had a deck of warped cards from a festival accident where they got wet. Plus this was in Pennsylvania a few weeks ago where it was like 90% humidity. So they were pretty warped. I put those in the press too but didn't get it anywhere near back to as flat and unwarped as a new deck. So it feels a bit to me like the card press - at least this one - isn't really doing much, if anything. What has been others' experiences with card presses? You were in Pa? Should have let me know. If you got close enough could have met up. have only heard good things about card presses from the people that sell them. Not the same thing, I know, but similar: I have a couple of Joe Porper card clips that work well. I live in the highly humid south and the cards I carry in my bag stay in the clips when not in use. The clips works so well that sometimes when I remove the cards they require shuffles and riffles to properly separate them. Not certain if they might suit your needs, but thought I'd mention them just in (card) case. Thanks. I should try a card clip, Anthony. Thanks for the tip. Bmat - I was in Slippery Rock/Butler at a festival called Pennsic - for the medieval group called The SCA. It would have been hard for me to get away unless you happened to be right in that area. Where are you in PA? I went old-school for when I've split cards, or had a deck that was warped. I have no clue where I got the plexiglass plates cut to somewhat bigger than a poker card, but I've got 8 of them. Then a trip to Home Depot for some clamps, and these things work great. In the image attached you can see the back side of a split card being held there in waiting. Currently I have 2 decks of Brooklyn Playing cards that were warped pretty badly all clamped up. One thing I've noticed, is that the presses work better when you put the cards in while they are still "wet." I believe this allows the cards to be "morphed as they dry." If they already dried out, then their form has already changed.